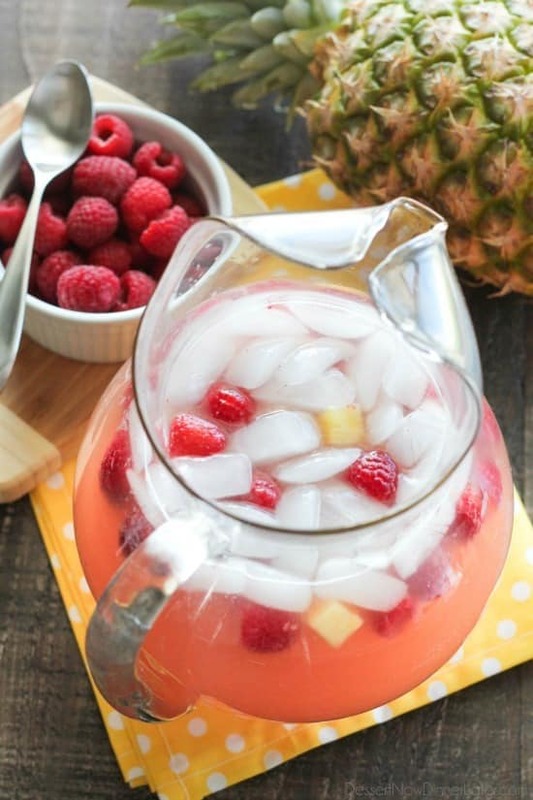 Raspberry Pineapple Punch - Dessert Now, Dinner Later! 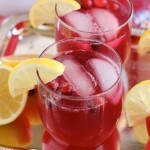 Raspberry Pineapple Punch is fruity, fizzy, and family friendly. 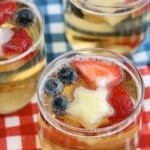 Great for your summer party or baby shower. One of my favorite things in life is sipping on a fizzy drink. I’m a regular at the soda shop here in town, which is good and bad. Haha. 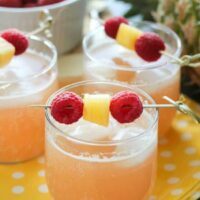 So when summer comes and I’m hosting backyard barbecues, the drink is almost as important as the food and this Raspberry Pineapple Punch was a hit! If you don’t know that I love raspberries, I’ll tell you now. I LOVE RASPBERRIES! I would pick raspberries (and pineapple) over any fruit on a fruit platter. So naturally this drink has some of both. 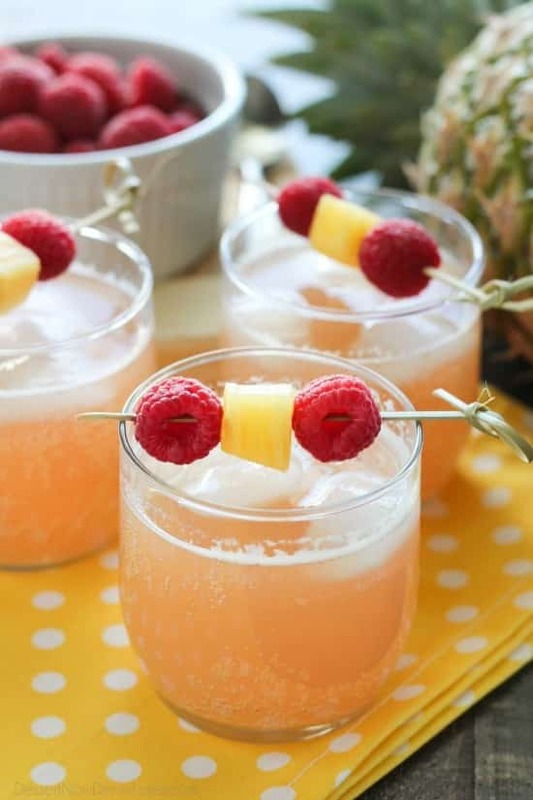 This Raspberry Pineapple Punch is made with raspberry lemonade, water, pineapple juice, and lemon-lime soda. At first you think it will be a little tart, but it’s crisp and refreshing, with just the right amount of sweetness. I also like that it’s a lighter color, so when the kids spill, which you know they will, it won’t be as big of a deal as a bright red fruit punch. 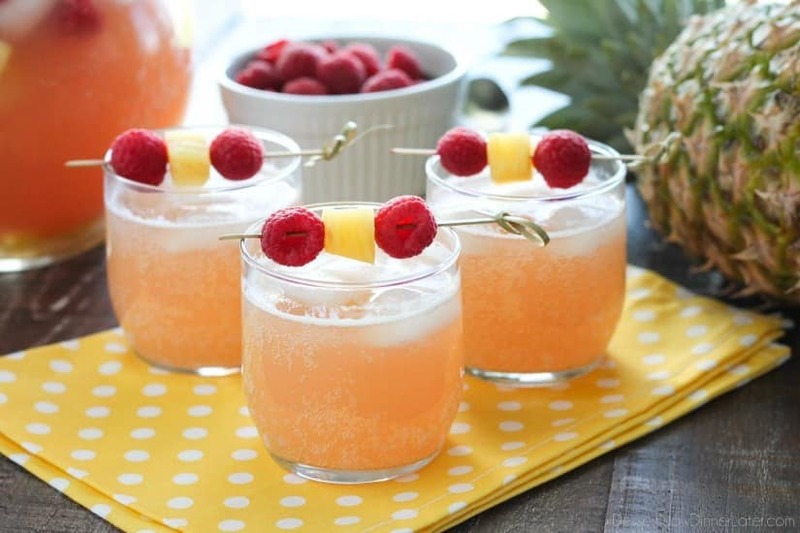 Adding fresh fruit to this Raspberry Pineapple Punch not only makes it pretty, it changes the color slightly too. 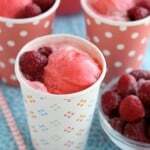 It’s more of a peachy color without the fruit, and more pink with the fresh raspberries in it. So pretty! It would be great for a baby shower too! 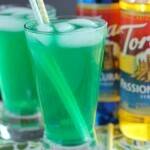 CHILL ALL INGREDIENTS BEFORE MAKING THIS DRINK. In a very large punch bowl or 2 gallon drink dispenser, stir the raspberry lemonade concentrate with the water and pineapple juice until combined. (Do NOT follow instructions on cans of raspberry lemonade concentrate.) Keep chilled. When ready to serve, add fruit and/or ice to the juice mixture. Slowly pour in the soda, and stir gently 2 or 3 strokes. Serve immediately. Store leftovers in the refrigerator.